Update: The technical alpha is live once more. 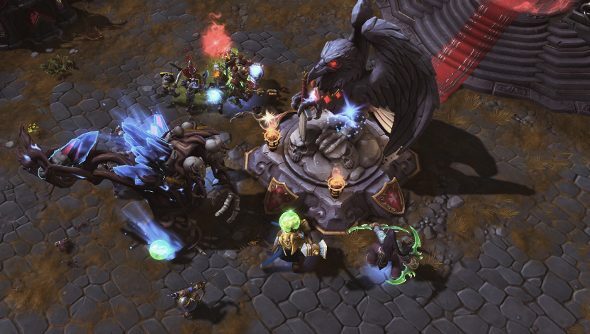 Heroes of the Storm’s technical alpha took a break last week, but it’s set to return soon with a whole bunch of new features that Blizzard want players to put through their paces. Today, the studio introduces three big ones: custom games, observer mode and replays. The early version of custom games will allow players to escape from matchmaking and set up their own battles with chums and foes. The mode and battleground can be selected, and both teams and their chosen heroes will be displayed in the lobby, along with any observers. If there’s an empty slot, an invite button will allow players to bring in new combatants and observers to the lobby. If nobody else is around, those empty slots can be filled with AI heroes. The host is given a slew of powers over the match, as well. Clicking on the wrench underneath a player will bring up options like team swap, kick or make observer, and AI bots can be customised as well. Observers will be able to see all the information that players can, as well as being able to share vision with every hero so nothing can be missed. Replays will let players relive their victories and losses, and it seems pretty simple. Clicking “watch” in the menu will bring up a list of replays from recent matches, and while watching them it’s pretty similar to the observer mode. But on top of all the information that’s displayed, there are controls that can be used to slow down, speed up and pause the match. Blizzard said that the servers would be down for about a week, and they went offline 8 days ago – so hopefully we can expect to be able to fiddle with these new features very soon.